PHOENIX – Saying it was a vote to make Arizona a safer place to live, House Democrats voted unanimously Thursday to ban texting and driving in the state. Their votes helped propel House Bill 2318 to the Governor's desk with a final read vote of 44-16. The bill bans texting while driving and makes it a primary offense. That was a request of family members who have lost loved ones in accidents involving drivers using cell phones, including the family of Officer Clayton Townsend of the Salt River Pima-Maricopa Police Department, who was killed on January 8. House Democrats opposed a Republican effort to confuse the issue with a second, overly broad ban on "distracted driving" that will increase racial profiling and other unintended consequences. Senate Bill 1141 passed along party lines with all Democrats voting no. Several Democratic members applauded the efforts over the past decade to pass the ban, including multiple bills sponsored by former Senator Steve Farley of Tucson. PHOENIX – House Democratic Leader Charlene Fernandez released the following statement after the House voted 55-5 today to repeal Arizona's outdated 'no promo homo' law that prohibits discussion of homosexuality in public school sexual education classes. Democrats have pushed for years to repeal the 1991 law, and helped negotiate an amendment to Senate Bill 1346 after the law was challenged in court. The bill now faces a potential final vote in the Senate. "Today we had the opportunity to stand together in a bi-partisan manner and right a wrong. We are repealing a law that has stigmatized untold numbers of Arizonans, and has led to erroneous and dangerous stereotypes, discrimination and bullying. Schools should be a safe, inclusive environment where every student has the opportunity to learn free from harassment and bullying. In Arizona we can't say that's the case. For the past 28 years, this law has amounted to an official state-sanctioned climate of discrimination. I am so proud of my colleagues who voted yes today to put this chapter in the rear-view mirror and move our state forward." 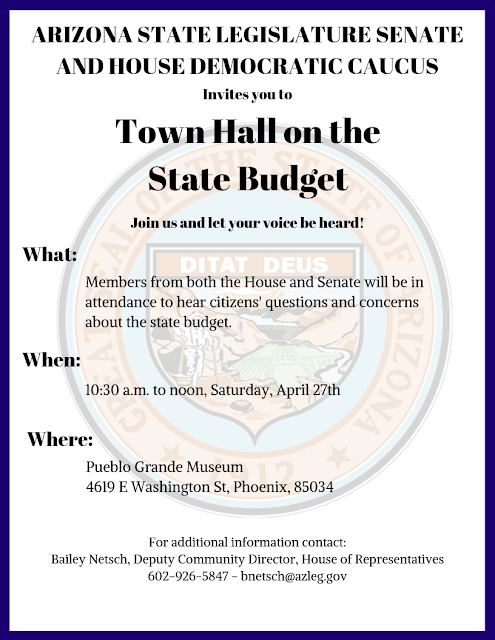 Speaker Bowers and Representative Fernandez will hold a media availability today at 4:00 p.m. in House Hearing Room 1 to respond to documents released by the House Ethics Committee. PHOENIX- House Democratic Co-Whip Reginald Bolding today spoke out against House Speaker Rusty Bowers' arbitrary decision on Monday to kill much-needed charter school reform for this legislative session. Bolding is the ranking Democrat on the House Education Committee, which was supposed to debate Senate Bill 1394 on Monday, and the lead negotiator on reforms for the House Democratic Caucus. Bowers refused to first read the bill, preventing a planned hearing in the House Education Committee on Monday, and then tried to blame Democrats in a press release. "The Speaker is disingenuously trying to blame Democrats for his decision to kill charter school reform when he supports the status quo that has enriched unscrupulous charter school owners with taxpayer money and outraged the public across the state. In reality, Senate Bill 1394's sponsor, Senator Kate Brophy McGee, would only accept input approved or written by charter school lobbyists on the so-called reforms, and even those purely cosmetic tweaks were too much for the Speaker, so he stuck it in his drawer and denied it a hearing. Despite the Speaker's unfounded claim, Democrats do not oppose charter schools. Democrats oppose powerful legislators owning charter schools and gaming the system to cash out with millions of dollars. Democrats oppose self-dealing and conflicts of interest that have gotten at least one district public school superintendent prosecuted but will still be legal for charter school owners because of this Republican failure. We have 29 House Democrats ready to support relatively minor changes to the bill that would add some actual transparency, oversight and teeth, and most importantly would restore public trust in our charter school system." Establish a prospective ban on for-profit charter schools(LINK). Require additional transparency for charter management organizations, CMOs, by requiring the disclosure of how much charters are paying for each service a CMO provides(LINK). Cap how much state money CMOs can spend on administration expenses(LINK). Provide additional transparency for charter holders by requiring the establishment of charter holder boards that are required to follow open meetings laws and cannot be filled with family members(LINK). Prohibit self-dealing by charter school board members(LINK). PHOENIX, State Capitol – Gov. Doug Ducey's promise to veto any anti-vaccination bill that reaches his desk is a strong stand for public health, Rep. Kelli Butler said today. Butler, ranking Democratic member on the House Health and Human Services committee, thanked Gov. Ducey for his opposition to a trio of House bills that could greatly increase the number of unvaccinated Arizonans and lead to a public health crisis. "It’s a relief to see Governor Ducey’s support of proven public health policy in his commitment to veto these dangerous bills," said Butler, D-Phoenix. "As many states are currently dealing with crisis-level disease outbreaks, it is important that Arizona send a strong message that vaccines are safe, effective and save lives. Health experts warn that many areas of our state are already below safe levels of immunization, and these harmful bills would have made this very serious public health problem even worse." Ducey was quoted this week saying he is "pro-vaccination and anti-measles," referring to a trio of bills sponsored by Republican Health and Human Services Chairwoman Nancy Barto that she forced through her committee last week. Butler and other Democrats on the committee argued the bills would put Arizona residents, especially school-age children, at risk of contracting and spreading previously eradicated diseases, such as measles, polio, and smallpox. House Bill 2470 would add a religious exemption from vaccinations on top of the existing personal exemption. House Bill 2471 would require doctors to give an inches-thick packet on each vaccination's research and ingredients. During committee, an infectious disease researcher testified that even she has a hard time understanding the information packet, let alone parents. House Bill 2472 would outline notifications and potential exemptions that health care professionals must provide to patients who are receiving immunizations. PHOENIX, State Capitol – Rep. César Chávez was appointed on Wednesday as Vice President of Membership for the National Hispanic Caucus of State Legislators. NHCSL includes Hispanic state legislators from both parties who communicate and advocate for Hispanic communities in the United States and territories. Chávez was appointed by Senator Carmelo Rios, the Puerto Rico Senate Majority Leader and President of NHCSL. Chávez's position will deal with recruitment for NHCSL. Chávez also the Co-Chair of the Arizona Latino Legislative Caucus and the first formerly undocumented member of the Arizona Legislature.